The world's youth deserve a better world. “We are a proud nation of more than 200 ethnicities, 160 languages. And amongst that diversity we share common values. And the one that we place the currency on right now -- and tonight -- is our compassion and support for the community of those directly affected by this tragedy. The April issue of The Atlantic features a troubling, but essential bit of reading for anyone who wonders why so much white supremacist-inspired terrorism is rearing its ugly head these days—most notably this past week, the March 15th rampage that killed 50 and wounded dozens in two mosques in Christchurch, New Zealand. We’ll examine a chart for that attack below, but the article, entitled “White nationalism’s deep American roots,” by Adam Serwer, is worth consideration first because it provides some important (if unpleasant) context. “[Rep. Steve]King’s recent question, posed in a New York Times interview, may be appalling: “White nationalist, white supremacist, Western civilization—how did that language become offensive?” But it is apt. ‘That language’ has an American past in need of excavation…. The seed of Nazism’s ultimate objective—the preservation of a pure white race, uncontaminated by foreign blood—was in fact sown with striking success in the United States. What is judged extremist today was once the consensus of a powerful cadre of the American elite, well-connected men who eagerly seized on a false doctrine of ‘race suicide’ during the immigration scare of the early 20th century. They included wealthy patricians, intellectuals, lawmakers, even several presidents. Perhaps the most important among them was a blue blood with a very impressive mustache, Madison Grant. He was the author of a 1916 book called The Passing of the Great Race, which spread the doctrine of race purity all over the globe…. If anything good came out of WWII, it was that fighting the Nazis woke Americans up to the evils of this deep-rooted racist perspective, but here we are 60 years later, and Nazi-style white supremacy is absolutely “trendy” in certain quarters. 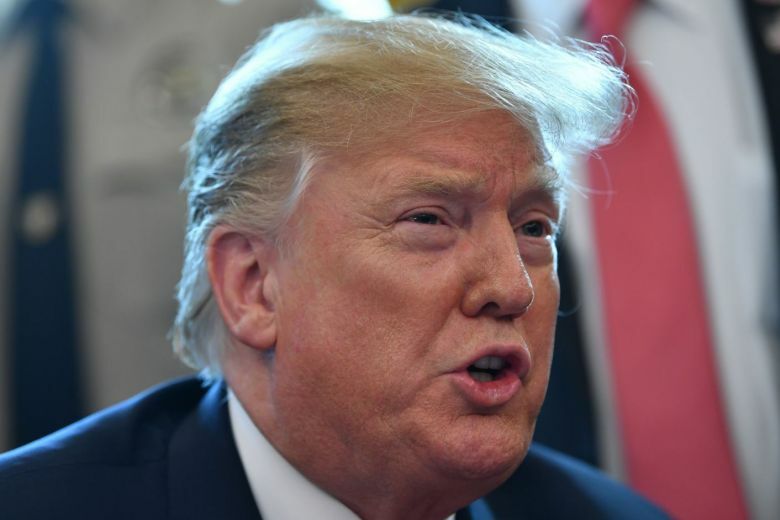 Right on schedule for that trend, which he didn’t really create but certainly knows how to exploit, Trump has enabled the return of Grant’s hateful sentiments, and whether Trump is personally a racist, anti-Muslim or not is immaterial. We’re all aware of the litany of transgressions Trump has committed against moral leadership when it comes to racial and religious issues—he came down the escalator in June 2015, ready to race-bait the country over Mexican immigrants, and early on in his campaign he promised a “complete Muslim ban” for immigration. Actions speak louder than words, of course—witness his many attempts to solidify that ban on Muslim immigrants, his policy of separating immigrant children from their parents at the southern border, and so on. He will have his wall across that border and it will stand as a monument to hatred and xenophobia, perhaps even more than the Berlin Wall did. The white supremacy movement is no problem for Trump. Those who say it’s “ridiculous” to thus blame Trump for any of these attacks have a point: he’s not pulling the trigger. But great power implies great responsibility, and toxic influence bears evil fruit. This goes for our leaders and it goes for us as a nation and people, too. IMHO, we’re talking about deep karmic responsibility here: with Pluto nearing its return Sibly position, we are being forced to deal with such chthonic responsibilities, and the more forthcoming we are, the better. There’s a reason that issues concerning systemic racism and toxic capitalism are bubbling to the surface now—the latter has always favored the wealthiest at the expense of everyone else, and has always required a “slave-labor class” of some sort, whether overtly as in pre-Civil War U.S., or in our long dependence upon migrant workers who worked for pennies an hour and were often treated deplorably. Today’s minimum wage workers don’t have it much better, scraping by from paycheck to paycheck. The global marketplace depends way too heavily on sweat shops, child labor and even worse. The fact is, there’s a known connection between the so-called “emergency” at our border, and this trans-national criminality, and it has to do with the gangs in the Honduras, Guatemala and El Salvador that so many families, women and children at our border are fleeing. It’s very likely these frightened people are indeed, fleeing for their lives, but more specifically, to avoid trafficking and enslavement. 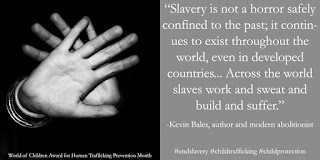 From author Kevin Bales' "World of Children" website. So when Trump said early on that there are “bad hombres” in Central America, he was correct from this perspective, but to react by attempting to wall off the victims of those bad actors—and whoever’s paying them to do what they do—is to become complicit in this 21st century slave trade. In fact, in a breathtaking reversal from humane policies supported by both the Bush and Obama administrations, the Trump administration has radically reduced the number of "T-visas" approved for victims of trafficking seeking asylum. He uses stories about human trafficking to sell his wall, but clearly has little compassion for the actual victims. IMHO, the Pluto transit we’re experiencing as a nation could go either way: towards purging and healing centuries of toxic karma over slavery and racism, or towards selling out our national Soul for a whole new, even darker cycle of vicious hatred and slavery. Who stands to profit from all this? As we’ve learned in these corrupt times, so many answers are gained by following the money. Are we that addicted to this poisonous legacy? When will we stop exploiting human beings for profit above all? This brings us back to the white supremacist agenda—people of color are fine if they’re exploitable, but when they demand equal rights and an equal place in society, that’s another story. The trouble is, those who are on the “front lines” of white supremacy are probably not the ones actually profiting from race-based exploitation. I would guess that most of these impressionable “soldiers” are probably being exploited themselves by those who ultimately profit from the hate and division. If Trump would ever convincingly speak out against the white supremacist agenda, his personal defense would sound more credible. But again, he stopped short of doing this. When questioned after the New Zealand attack about whether a rising tide of white supremacy is a problem, he responded “not really,” adding that it’s just a “small number of people with very, very serious problems.” He never explicitly condemned the shooter’s stated agenda, and never offered his support to the Muslim community. Instead, he pivoted to a weekend explosion of Twitter rage about everything else imaginable. True to form, when he can’t address an issue head-on, he deflects. 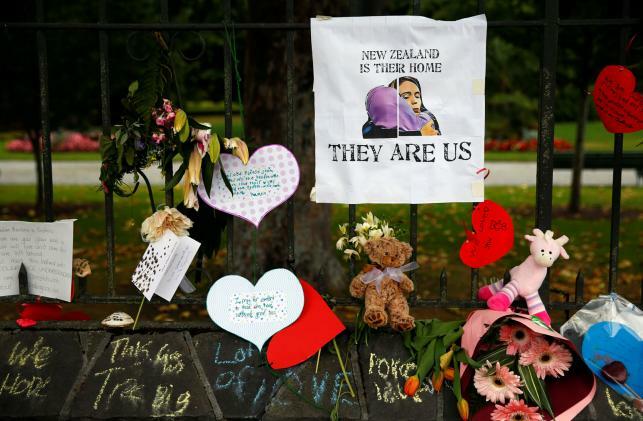 The New Zealand mass shooter didn’t just kill 50 people from ages 3-to-70-something and wound dozens more in two mosques on March 15th, he posted his manifesto on social media beforehand, which made his actions in Christchurch, New Zealand part of an international burgeoning white supremacy-motivated terrorist trend that bursts into view sporadically here in the States and in Europe. The Anti-Defamation League reports that propaganda supporting a white supremacist agenda in the U.S. (the greatest percentage against people of color or non-Christians) is up 182% in the past year. How is this happening? “The manifesto is a result of a life lived in the worst parts of the Internet, where the most vile thoughts can be expressed through, and alongside, moronic inside jokes. But experts have warned that this juxtaposition is not one of the harmful and the harmless. Extremist beliefs and edgy meme culture work together online to reach larger audiences. The manifesto isn’t a valuable look inside the mind of a mass murderer, and the memes he referenced are not a separate curiosity. Instead, the gunman created a press release for racism…. A man accused of killing 10 people in a van attack in Toronto last year had posted meme-laden in-jokes before the attack that were meant for the insular, misogynist incel community. In 2015, the gunman who killed WDBJ TV reporter Alison Parker and cameraman Adam Ward in Roanoke filmed the shooting, posted it to Facebook and advertised it on social media accounts. By 2019, we know that mass murderers want to go viral and that social media is making it easier for that to happen. 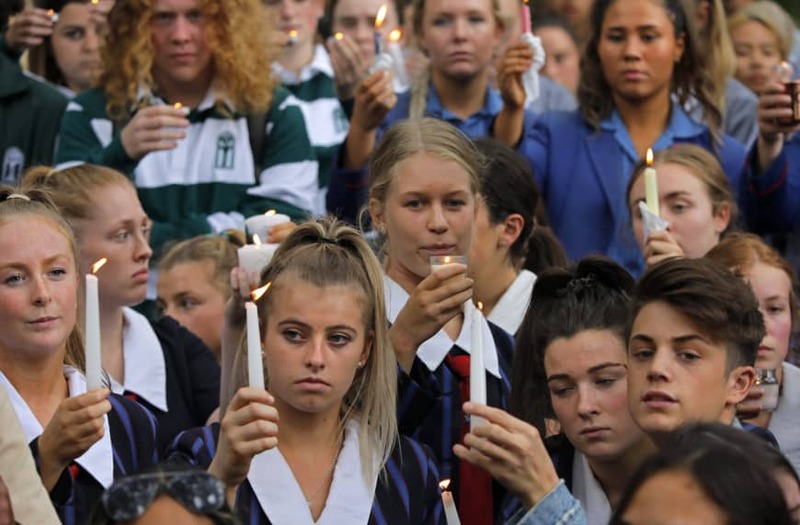 The almost Crusader-like targeting of non-Christians in more and more of these attacks—last year’s in the Pittsburgh Tree of Life synagogue and this one in two New Zealand mosques—is also intriguing, as though the way to defend Christianity is to drag its name through the worst kind of mud. Those who compare these attacks to ISIS-for-Whites are probably on to something, but again, who’s feeding this phenomenon? 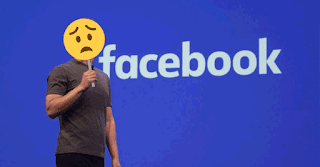 Social media has become its powerful platform, even though the companies are scrambling to protect themselves from the dark forces they’ve enabled. Virality breeds epidemics! Astrologically, this brings Neptune into the picture, with Uranus implicated in the technology and violent shock value. We’ll see how these forces, among others, colluded on March 15th ahead. Ardern is being praised for her leadership, grace and empathy in the wake of this crisis. Social media looms large in all these terrorism cases: it’s pretty clear the New Zealand shooter doesn’t care what anyone besides his social media audience thinks about his actions—he was throwing them a fresh thrill to savor, and they undoubtedly got what he was trying to accomplish. As if the carnage the shooter produced wasn’t enough, he had to mug for the camera on top of it. I wonder how his audience felt about little 3-year old Mouad running towards the shooter before dying? After the shooter was apprehended by New Zealand police and identified (he shall remain nameless here), he flashed a known white supremacist hand signal for “OK” to the camera for his mugshot. We forget the chilling lows to which those consumed by absolute hatred—and/or absolute greed—can go. In crisis times, leadership requires heart. Ardern has personally comforted victims’ families and been fully involved in making sure victims’ families are assisted financially and in any way possible. 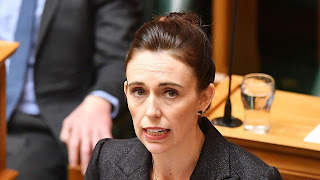 Since that first statement, she has also indicated that the New Zealand parliament will be discussing ways to alter gun regulations, and given that Australia already has tighter gun regulations, perhaps her efforts will bear fruit. She’s showing true leadership and heart—a rare combination these days. So, astrologically, what can we make of these increasingly common violent attacks? Analyzing an event clearly doesn’t change the facts on the ground or alter the violent trend, but as we’ll see ahead, that feeling of helplessness in the face of our complicated world is all part of the story. Was it just an “evil,” destructive kind of day, astrologically? No—the energies at work were available to all that day, and thankfully, lots of good things happened as well. 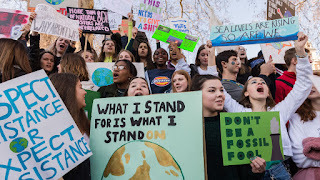 Notably, students all over the globe poured out of their classrooms to protest how little attention the global powers are giving to the perils of climate change. 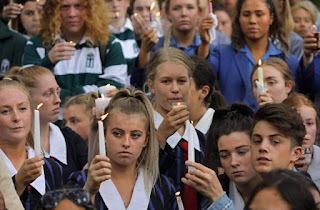 They were affirming their youthful commitment to Life, channeling the same planetary energies the New Zealand shooter had at his disposal, and they made a definite impression, despite the heavy distractions in the news. That redeeming fact will at least make the following chart analysis for the New Zealand attack a little less grim. Chart #1 below is cast using data provided by Wikipedia. 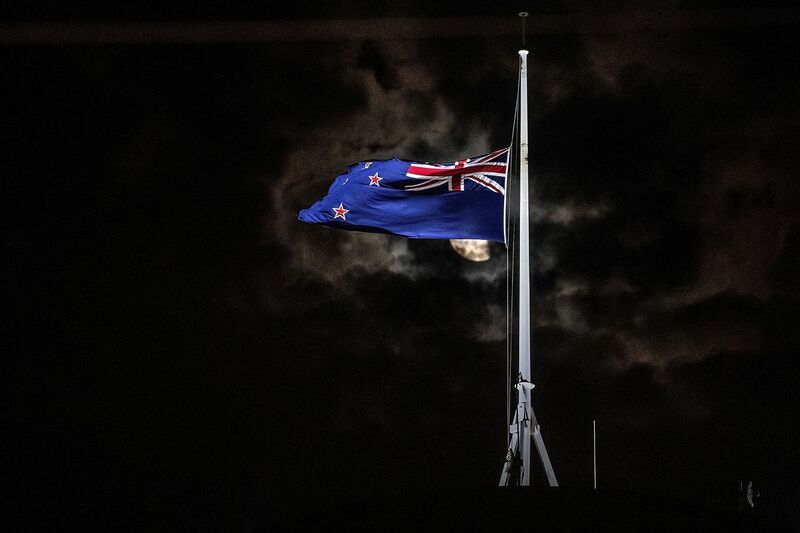 Chart #1: Christchurch attacks-NZ, March 15, 2019, 1:40 p.m. DST, Christchurch, New Zealand. Tropical Equal Houses, True Node. Mutable angles: Mercury-ruled Gemini rises, with Mars in the 12th (Taurus), sextile Neptune (Pisces) and square Venus (Aquarius). Whenever senseless acts of mass violence burst onto the scene, the “usual” astrological suspects are Neptune and Pluto, with a strong possibility that Uranus and/or Mars are on board for shock value, but the inner planet aspects noted here remind us that the “senseless” nature of such events depends upon very personal dynamics—i.e., the mental and spiritual state of the perpetrator. Mass violence events often seem to carry a common theme of anxiety- and fear-laced hatred and resentment, and I can’t think of a better description of the white supremacist agenda. An intense dread over the loss of clear boundaries and borders and over what feels like a “leveling out” of all people across racial lines (dissolving ancient privileges) is a very Neptunian phenomenon. The opportunity and will to lash out against these perceived losses is represented by the Mars-Neptune sextile. In the end, however this perception of loss is in the zero-sum mindset of the attacker: if someone else gains something, I must be losing. It’s not hard to see the Neptunian dynamics in this chart: it’s ruled by Mercury Rx, with Mercury Rx conjunct MC and Sun in Neptune-ruled Pisces and violence-prone Mars in the naturally Neptunian 12th house. This suggests that frustrated machismo was an unconscious driving force for the violent outburst. Venus’s rule over that Taurus 12th and square to Mars adds a cold Aquarius/Uranian will-to-shock dimension to the violence—again, it appears the shooter was acting to impress and “troll” those who recoil at the senseless hatred. A potentially delusional, ideological Mercury (also widely conjunct Neptune) clearly dominated this event, but the shooter was seeking some kind of “outlaw” satisfaction: Uranus (Taurus) also forms a mutual reception with Venus (Aquarius). With all the Pisces energy involved here—and the Mars/Jupiter midpoint square ASC from Pisces, his “satisfaction” could take the form of twisted heroism or martyrdom. Mercury Rx-MC-Sun (Pisces) sextiles Pluto-So. Node (Capricorn) and trines No. Node (Cancer). These aspects tap into the somewhat troubled role of the Cancer-Capricorn Nodal axis in history; this axis was almost exactly flipped with Capricorn on the north end in 1935, the year Hitler, Mussolini and Stalin consolidated so much of their power, and a big “coming out” year for Hitler’s Nazi philosophy. Hitler began blatantly violating the post-WWI Versailles Treaty, reinstating the German Luftwaffe, rearming Germany and passing the Nuremberg Laws, stripping Jews of German citizenship. He was preparing Germany for a retaliatory war, in other words, casting the Jews as scapegoats for everything Germany had suffered to that point. By the time WWII was winding down in 1944, the North Node had circled back to Cancer, but the horrors were far from over: the Holocaust was ongoing, even though the German war machine was weakening. 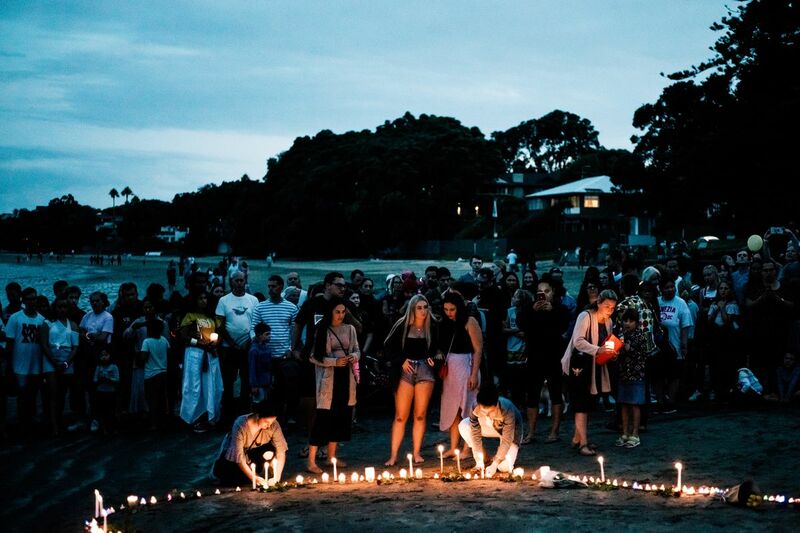 Does the New Zealand shooter imagine himself to be part of that dark history? I won’t be tuning into the current propaganda to find out, but what was once considered heinous and evil has apparently been regenerated and recast into a glorious saga in some minds. The Neptune-Pluto-Nodal axis “worm” turns in unfathomable ways. The real idea whose time has come. Jupiter (Sagittarius) squares Sun-MC-Mercury Rx (Pisces) and inconjoins Nodal Axis (Cancer-Capricorn). Jupiter applies pressure to manifest some Neptunian (Pisces) ideal here, as though it’s pushing an “idea whose time has come.” Thankfully, the shooter’s “idea” wasn’t the only way this aspect could have expressed. Think about those students protesting the slow progress of climate change mitigation—they were saying that the time has come for the idea of climate change mitigation to be taken seriously. The shooter, of course, had a much darker spin on those same energies. This aspect is important for the way it highlights the late stage positions of three important waning cycles—Jupiter-Saturn; Jupiter-Pluto; Saturn-Pluto. Saturn’s not directly involved in the squares, but it is forming its waning sextile to Neptune, which is very much involved. I’ve discussed in several other posts that this preponderance of waning cycles we’re experiencing right now has a lot to do with the crisis-driven tone of our times. So much old, outworn energy is cleared out while waning cycles complete and begin anew, and this clearing out agenda segues nicely with the karmic imperatives of our times. Notice that Jupiter rules the 7th and co-rules the 10th in this chart with Neptune, a planet it widely squares. We can see the tension between these two in Prime Minister Ardern’s determination to deny the shooter the notoriety he was after. Admirably, she says “you’ll never hear me mention his name,” but she’ll speak his victims’ names loud and clear. This is doubly admirable in a time when wielding power with integrity demands more courage and determination than usual—Jupiter semi-sextiles (inconjoins) Pluto-So. Node. Corrupt practices and the abuse of power can be the convenient default mode in times like this, and we don’t have to look far to see the results: corrupt players enable and exploit violence for their own dubious purposes. Social media platforms play an unfortunate role in domestic terrorism. Jupiter’s square to Mercury Rx-MC applies pressure to the media in this chart as well, and as we witnessed in the news, social media platforms were forced to scramble to stop the shooter’s video in its tracks. Apparently, a small number of people viewed the shooter’s live stream, but the video still managed to go viral across the entire Internet within minutes. It was posted and reposted in different forms to evade the algorithms that are supposed to police the content—sounds like tactics that the white supremacist audience have cultivated. 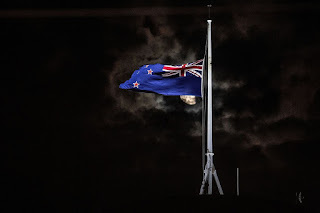 To their credit, New Zealand telcom executives sent an urgent letter to Facebook, Google and Twitter and called upon them to immediately fix whatever stopped them from responding quickly enough to the shooter’s video. Perhaps if Mercury hadn’t been retrograde, these media platforms wouldn’t have responded so slowly? It sounds like perhaps they need to rely less on algorithms and bots and more on people who follow breaking news. The urgency to regulate and/or install better controls over what amounts to terrorist propaganda is seen here in Saturn sextile Neptune, and this urgency will probably only heighten as Saturn closes in on Pluto in the coming months. How much control is desirable? It may depend upon who’s trying to control what. Balancing free speech with heinous propaganda is an imperative for our times, but there’s nothing easy about it because it’s a slippery slope if there ever was one. Wouldn’t the Trump administration love to shut down sectors of the media he doesn’t approve of? Undoubtedly, we’ll be hearing more about all this. Ardern is working with the NZ parliament to change gun laws. Moon (Cancer) squares Chiron (Aries). This aspect speaks—tragically—for itself: families, mothers and children were all shattered and wounded by the shooter’s actions, and to add insult to injury, the victims’ families are having a hard time getting their loved ones’ bodies back in time for a proper Muslim burial. It’s cold comfort, but the Moon’s out-of-sign trine to Pallas (Libra) may suggest that justice will be forthcoming, but the process will be fraught and painful. It will likely also feel like a case of global karmic justice, however: Pallas also squares Nodal axis (Cancer-Capricorn). There’s a reason the Cancer/Capricorn (and vice-versa) nodal axis is prevalent during tumultuous periods (WWII, the Kennedy assassination, leading into the Vietnam war; Watergate/end of Vietnam; the dissolution of the USSR in 1991; the 9/11/2001 attacks, leading into the Afghanistan and Iraq wars, and now, an emergent white supremacist challenge, climate change, etc.). During these nodal times, people feel the cosmic “push” to build lives, families and careers, and when things are not going according to plan—when their needs (Moon rules Cancer) are not met and when they feel like failures (Saturn rules Capricorn) because decent jobs are inaccessible to them, they look for something or someone to blame. They withdraw into fearful shells, seek common cause with others who “get” what they’re going through, no matter how deluded or misguided those others might be, and it doesn’t take much to turn these circumstances into a toxic brew. Many take their chances in the military during these periods—for instance, many born in the 1970s with Saturn in Cancer enlisted after the 9/11 attacks. In fact, for some youth who resonate with the Cancer-Capricorn axis, a new policy of mandatory public service could help (military or not); ideally, it would help them find their place in the world more positively—social media as a guiding force leaves a lot to be desired. Significantly, today’s nodal axis is cutting directly through our Sibly chart’s Mercury-Pluto opposition (chart not shown): heavy political/corporate control over our national discourse is taking its toll on our democracy, and we need to come to grips with that because it is not helping with the problems that explode into view every time there’s a mass killing like we saw this past week. Where is the line between national security and privacy? Where do our First Amendment rights end and the need for some sane level of control over social media content begin? How can we provide more constructive outlets for youthful energy? The answers are out there! I began this post by pointing out that America is far from innocent when it comes to white nationalism/supremacy and its history, but I don’t believe that makes us a racist nation at heart. I believe we’ve come a long way since the 1950s because I’ve seen it with my own eyes. We have regressed in the last decade, however, especially under the present administration. IMHO, young people caught up in today’s recycled delusional, hateful ideology are acting (at least in part) out of fear and anxiety for their own futures, and nothing our politicians and leaders have been doing lately is really addressing the roots of that anxiety. People who feel hopeful about their futures are far less likely to hate those around them and wish them harm. History is filled with examples, so it’s no surprise that those who never really recovered from the 2008-10 recession have become really frustrated. They, too, have potentials, dreams and legitimate needs, and in a just economic system that works better for everyone, they could experience some progress. So now we seem to have a new generation of angry, “brutal” youth for a new generation of power players to exploit, and I suspect we could learn something by comparing the dynamics in play in each generation’s Pluto ingress chart—a story for another day. What we call the “Greatest Generation” here in the U.S. (i.e., the Pluto in Cancer generation) was the same generation in Germany that fought for Hitler and enabled the Holocaust—Pluto is only as positive or negative as we make it. Today’s young warriors (and white supremacist terrorists) are most likely from the Pluto in Scorpio and Sagittarius generations, and both signs are capable of great dedication, but also great violence, when pushed too far. Again, seeing a bright path forward could change so many lives. Of course, none of this excuses violence and brutality, let alone actual terrorism, but the rest of us aren’t off the hook either. We’ve all contributed to the world our young generations are trying to navigate, and IMHO, we owe them whatever support we can muster. 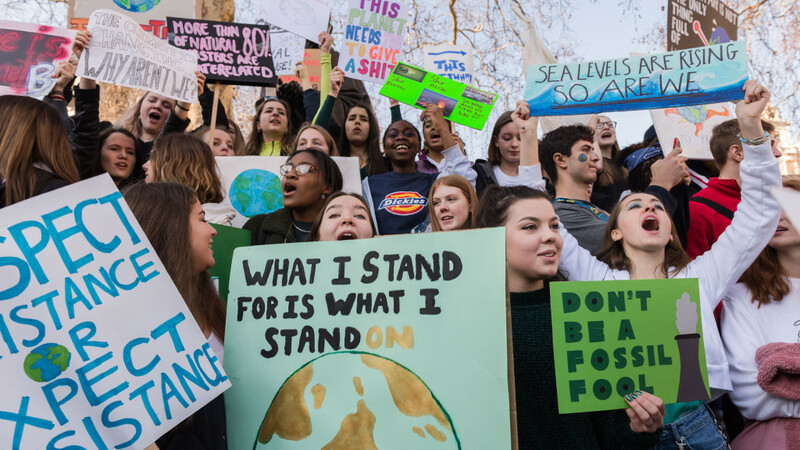 We might start by getting behind those courageous kids who stopped everything to protest climate change inaction! 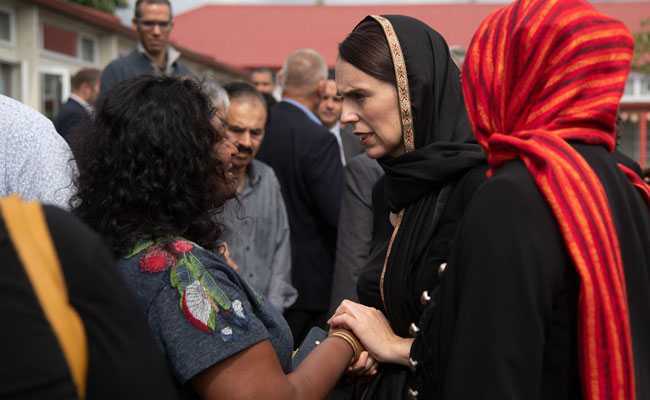 Our deepest condolences to the New Zealand Muslim community and our thanks to Prime Minister Ardern, for her strong, compassionate leadership. We’re all in this together! We can learn a lot from New Zealand's example. Cited in Mario Kamenetzky, The Invisible Player: Consciousness as the Soul of Economic, Social, and Political Life, Park Street Press, Rochester NY, 1999, p. 63.